(NEW YORK DAILY NEWS) - Student narrowly avoids blindness following gruesome eye infection — parasite grew on dirty contact lens and ATE THROUGH HER EYE. 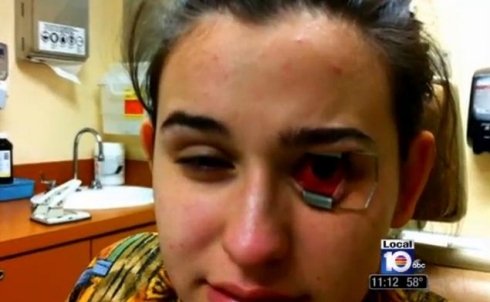 Ashley Hyde, 18, contracted an acanthamoeba infection in her left eye after failing to change her lenses regularly. Doctors had to drill into the Florida high school student's eye and take scrapings from the eyeball. They soon discovered the microscopic parasite - found in water and soil - had latched onto and spread across the lens.